U.S. healthcare is so expensive that records are broken even when cost increases slow. According to a new report by Milliman, a global consulting and actuarial firm, the total cost of healthcare for the average family of four, if covered by a preferred provider organization, is now a record $19,393. That might be only 7.3 percent higher than last year's average cost of $18.074, which is the smallest year-over-year increase in almost a decade. But it's also the highest year-over-year increase in total dollars spent per family at $1,319. Trends over the last decade more completely illustrate the toll taken on the average American by rising healthcare costs. "In 2002, American families had healthcare costs of $9,235, and those costs have now doubled in fewer than nine years," said Lorraine Mayne, Milliman principal and consulting actuary, in a press release. "As costs continue to grow -- and even as the cost trend decelerates -- the total cost of care for American families constitutes a larger and larger portion of the household budget." Of that $1,319 increase, employers were paid for 48.6 percent of the increase, while the additional 51.6 percent was the responsibility of employees. That's only slightly different from trends of the last five years. Over that period, employers have absorbed $3,023 in additional healthcare costs, employees themselves absorbing only slightly less, at $2,988. Take away costs paid by employers, and the employee's share of costs has still doubled. 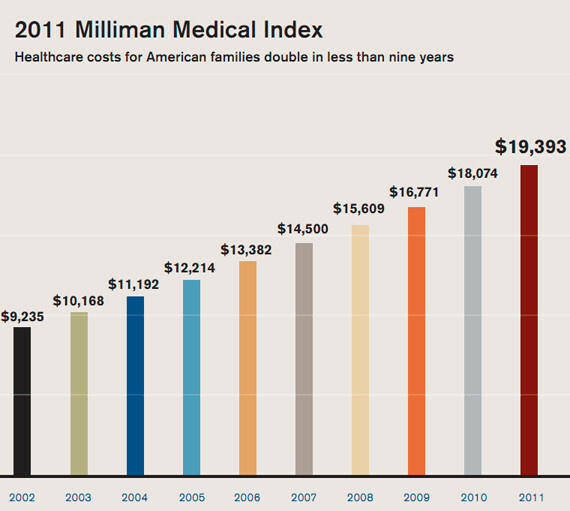 In 2010, the average employee paid $8,008 for his family's healthcare, up from $3,634 in 2002.